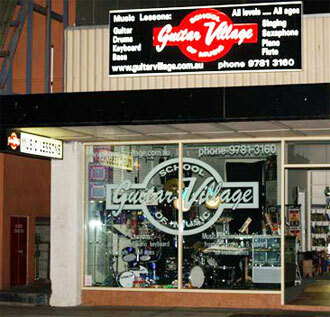 Guitar Village School of Music opened in May 2007 located at 439A Nepean Hwy Frankston (just a 2 minute walk from our store in Park Lane). We now offer lessons in Guitar, Drums, keyboard, Singing, Violin, Bass, Saxophone, Flute, Ukulele and Piano. Also Rockband for 4 – 13 year olds. Call on 97815984 or 97813160 for more info. Huge music school located in Frankston. Lessons available in all instruments for all ages and all levels and in all styles. Guitar Lessons, Drum Lessons, Singing Lessons, Keyboard Lessons, Piano Lessons, Violin Lessons, Bass Guitar Lessons, Flute Lessons, Clarinet and Sax lessons all available. Call Sue Or Bob at the School on 9781 3160. If you live down the mornington peninsula guitar village is centrally located in Frankston. We are also affiliated with local schools in Somerville, mount eliza, mornington, seaford, chelsea, somers, sorrento and rye, so make sure when booking a lesson to see if you are entitled to a local school special. Guitar Village School of Music is Located on the Mornington Peninsula just a 40 minute drive south of Melbourne.